Islamophobia is undoubtedly on the rise, and the stories of of Khairuldeen Mahkzoomi and the Shebley family demonstrate just how rampant it has become, particularly in U.S. airports. In both cases, the people targeted were asked to leave the plane for “security reasons,” which just might have something to do with Islamophobic notions of speaking Arabic or wearing a headscarf while in an airport. Although these stories sensationalize the outrageousness of blatant Islamophobia, as they should, there are millions of unglamorous experiences which go unreported, due in part by the settling in and legitimation of Islamophobic rationale. What had I done to deserve to be on a terrorist watchlist? Was it my politics? Was it my religion? Was it my national origin? Was it my activism? Was it the countries that I’d visited? What about my rights as a U.S. citizen carrying a U.S. passport? As a frequent traveler, I became accustomed to the violence that comes with being on the SSSS list, yet realized that many people are still completely unaware of what it entails. Given the drastic increase in harassment and forced removal of Muslim and Middle-Eastern appearing individuals from planes, I want to highlight the lesser-known violences we are enduring at the hands of airport security – the ritualized, swallow your pride, and don’t-you-dare-resist torment of airport security. Having been on the list for about one year now, I know that it applies to both international and domestic flights. The following experience is as an SSSS traveler regarding a flight from Los Angeles (LAX) to Oakland, California (OAK), yet is something I experience on all flights. Being on the SSSS list means, first and foremost, that I am presumed to be suspect. Here, I am guilty until proven innocent. This means that as a “selectee” I am unable to check-in to my flight online or at home. I must check-in at the airport and may be asked to provide two different forms of ID instead of just one. Then I receive a boarding pass with the big bold letters, SSSS. As I head to security and go through the routine preliminary ID check, I prepare for that scrutinizing gaze. I see a mixture of shock and panic on the TSA agent’s face as she scans my boarding pass. She no longer sees me as a harmless graduate student going on a weekend getaway. She now sees me as a high level potential terrorist threat. And that is exactly how I am treated henceforth. At this point, the TSA agent asks me to step aside and calls her manager, the only one who is authorized to perform the SSSS security check, along with extra personnel to assist her. 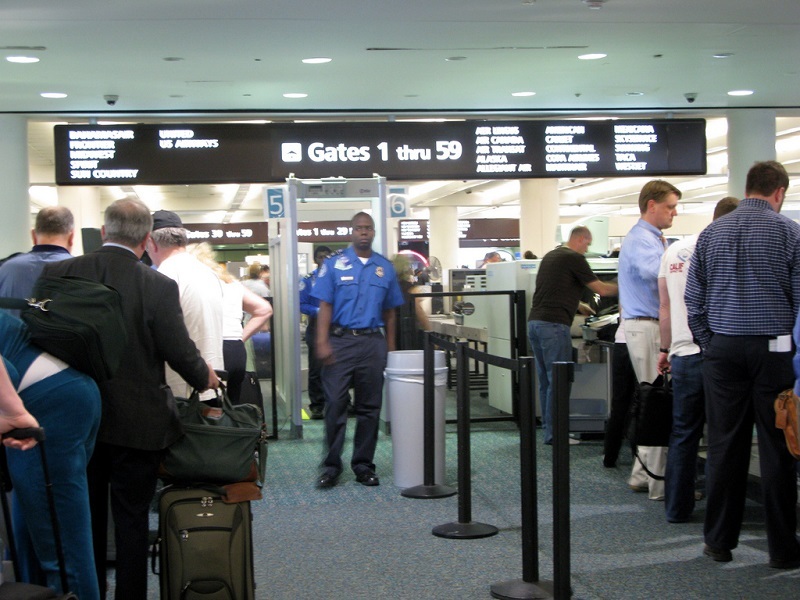 As a “selectee,” you must be escorted by at least two TSA agents at all times throughout the security process. Led and monitored by the two female agents, I am asked to go through the initial security process, remove my shoes, take off my belt, and place everything on the conveyer belt to be screened. After going through the standard security check like everyone else, I am taken into round two. The TSA manager communicates to me that they are about to do an elaborate body search and material search of my belongings. The TSA agent, with the manager standing overhead, takes every single shirt, sweater, and sock out of my suitcase. She checks every single zipper, pouch, and compartment in my luggage and inspects every last piece of clothing. She does the same with my personal bag, flipping through every single page of every book I have. She noses through my headphones, chapstick, and travel-sized Quran. I stand aside, powerless and silent, while she dives carelessly into all of my valuables. This is what it means to be targeted and violated by the U.S. security apparatus. After rummaging through everything I have, they take me into a back room and begin “searching” me. The search quite literally amounts to molestation. All in the name of security, they touch every square inch of my body, from digging into my hair to checking the bottom of my feet. The claim to protecting my personal privacy is that they use the back of their hands while nearing sensitive areas. However, they still use their hands and they still search those areas. I realized that it didn’t matter whether it was my religion, skin color, national origin, politics, or whatever other illegitimate reason they use to legitimatize this violence. The psychological torment that comes with traveling is guaranteed for those targeted by the U.S. security apparatus, particularly for Muslim women who are already conditioned to accept state violence. I now know I do not have access to citizenship, freedom, or even my own physical safety in airports. So no, I have not been kicked off of a flight, but I have endured – and continue to endure – the hell that comes with being on this terrorist watchlist. Along with the hundreds of thousands of other Muslim and Middle-Eastern appearing individuals caught up in this TSA nightmare, I go into and leave airports feeling humiliated and violated. This systematization of Islamophobic violence is no coincidence. Islamophobia is a multi-million dollar industry which works to rationalize and normalize fear against Muslims, facilitating the implementation of for-profit contracts between the U.S. government and private security companies. The growing infrastructure of Islamophobic fears sandwiched into U.S. government policies, both domestically and internationally, exemplify the drastic increase in hyper-surveillance of Muslim communities and the material profits made by these fearmongering businesses. This is not an accident. This is institutionalized Islamophobia in action. Submitted by Shawndeez Davari Jadalizadeh, who is a PhD student at UCLA in Gender Studies. The International Modest Fashion Design Festival (IMFDF) is Happening Soon!